Cherries are flooding the supermarkets near me, for under $2 a pound. They’re one of the many things that I look forward to in summertime. Last weekend, we put a homebrewed sweet/sour cherry beer into secondary fermentation – should be ready next week. Made with 3 lbs of sweet roasted Bing cherries, and 3 lbs of sour Morello cherries. Excited to try it is an understatement. I’ve also been baking up plenty of sweet treats in the kitchen with these little gems – including, but not limited to, this fabulous ice cream and these delectable brownies! A rich, fudgy brownie studded with juicy roasted cherries? I was sold on these the day last August when Annie posted them – but, cherries were back up to $5/lb at that point, and I resolved to put it off until next summer. Well, here we are my friends. I can safely tell you that these brownies are worth the wait. Hell, they’re so good – it’s worth paying $5 per pound for the cherries! I made them for a girls night last weekend, and they were a hit. I originally planned to serve them with a scoop of vanilla ice cream on top, but they were so rich and decadent – I didn’t even bother. Make these, now! Preheat the oven to 450 F. Combine the cherries and 2 tablespoons of the sugar in a small roasting pan and toss well to combine. Roast the cherries for 10 minutes, or until they begin to release their juices. Remove the pan from the oven and reduce the oven temperature to 350 F.
Line a 9 x 9-inch baking pan with foil (I used an 8×8 – yields a thicker brownie). Lightly spray the foil with cooking spray. In a medium bowl, combine the eggs, remaining sugar, vanilla and salt; whisk until combined, about 15 seconds. Whisk in the warm chocolate mixture until incorporated. Then stir in the flour with a wooden spoon until just combined. Gently fold in the roasted cherries. Pour the mixture into the prepared pan and spread with a spatula to make an even layer. Bake until slightly puffed and a toothpick inserted in the center comes out with a small amount of sticky crumbs clinging to it, about 35 minutes. Transfer the pan to a wire rack and let cool to room temperature, about 2 hours. 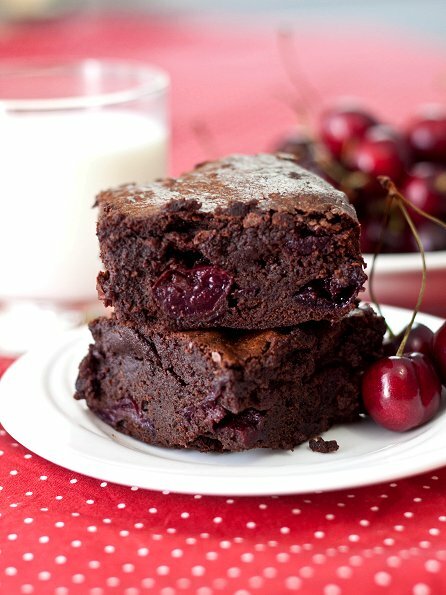 I have a ton of cherries in the fridge, looks like these brownies are in my future. Holy moly these look awesome! I just bought some cherries and might have to make your recipe this weekend! What perfect brownies, I love how thick and fudgy they are! WOW! That picture is beautiful! Anything doughy and fudgy is right up my alley:)) And roasting the cherries beforehand is such a great idea! I wanna try that with pancakes! Wow!! These look good. Top of my to do list. Hi! what an interesting combination kind of like a black forest brownie! I’m wondering is it possible to use presserved or canned cherries? we have cherries here but they are quite expensive any time of the year. Hey I never heard of roasting cherries before. And cherries under $2 a pound, now that is amazing! And no lie I just looked over at a store circular and this week they have cherries for $1.99 a pound! Oh goodness! I love that juicy cherry right in the center of that brownie! I think I missed the window for cheap cherries out here. They were $1.99/lb a few weeks ago but now they’re back up to $5. Bleh. This is exciting! I have just stumbled upon a homemade sour cherry jam and I have a bunch left of really delicious cherries waiting to be transformed into another treat. This is the first time I will ever try roasting cherries. I am sure this will be wonderful, I am a brownie fan as well. So glad you enjoyed these! I’m totally craving brownies now. Well, let’s face it, I’m pretty much always craving brownies. This recipe is fantastic! I made these and immediately needed to make 2 more batches. It’s a good way to use my Evans sour cherries and the combination of cherries and chocolate is so tasty.